Thank you so much to all those who linked up last month! At this time of year many of us are thinking about booking our summer holidays, however for families with physical and sensory access needs, staying away from home can be stressful! It was lovely to read this positive holiday experience by Rainbows Are Too Beautiful. Particularly interesting for us as both my kids love being outside, especially EJ who thrives on the immersive sensory experience nature provides (the light and shade, the feel of wind and rain, the differences in sounds, smells and even tastes) so a forest holiday would be ideal for us, and a holiday home with a safe outside space would be perfect! A few of the posts last month were about how just getting out of the house can be a mission, never mind going on holiday! In this aptly named post, Project Get Out of the House, Orange This Way determines to start a new #wheelygood resource for Devon and Cornwall to help visitors and locals alike to find wheel friendly places & activities! In Where Were the Good People, Ordinary Hopes asks why people stand by and allow others to struggle, and even become victims of bullying behaviour, sometimes in circumstances where a little thoughtfulness or a kind gesture could easily make all the difference. While on the other hand, Raising a Superhero tells of a lovely Christmas outing where inclusion was at the heart of the experience and is definitely an Afternoon Tea with Father Christmas I’ll be looking up next festive season! 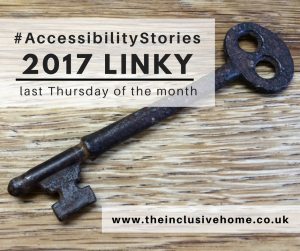 Accessible toilets is a favourite theme, well, when I say favourite theme I agree with Ordinary hopes in her post Petitioning for What?, in that we shouldn’t even need it to be a theme for discussion (…please do sign the petition though!)! However on reading this update by Mum on a Mission about her an ongoing correspondence with Cineworld it’s pretty clear that we do need to continue to lobby for greater clarity of standards, as the big service providers still seem to believe the guidance doesn’t apply to them! On the positive side for loos, it was great to read this fantastic guest post by Brody, Me and GDD about changing places toilets on Mumsnet, with loads of fantastic comments, many from people who hadn’t heard of the campaign before – it’s always brilliant to reach and gain support from people not directly affected by the issues! Please comment on this post to introduce yourself if you’re new to the linky, and comment on some of the other linked posts to help share ideas and experiences! 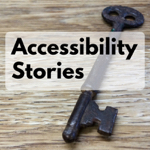 It would also be amazing if you could share your post (using the hashtag #AccessibilityStories and/or the shorter #AccessStories) on social media to help spread awareness of the issues around accessibility! I’ll also try to retweet as many posts as I can! Previous Post Not enough space?